Climb where the weather is stable, the mountains are tall and glaciated, and the culture is alive. Leave the crowds behind and step deep into the Peruvian Andes. 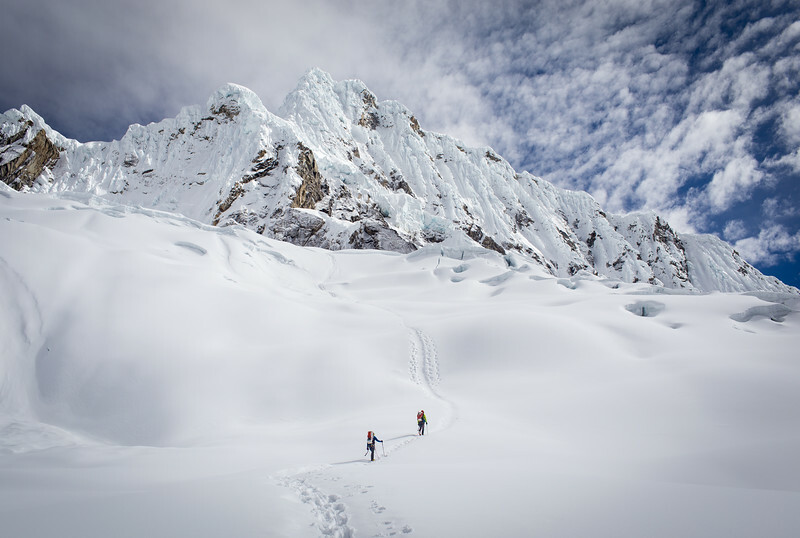 The Cordillera Blanca (White Mountain) range has many possibilities for your climbing ambitions. We specialize in private trips, and will create an expedition crafted around your schedule, abilities, and interests. This is adventure travel exactly the way you want it. The life experience you will walk away with is priceless. 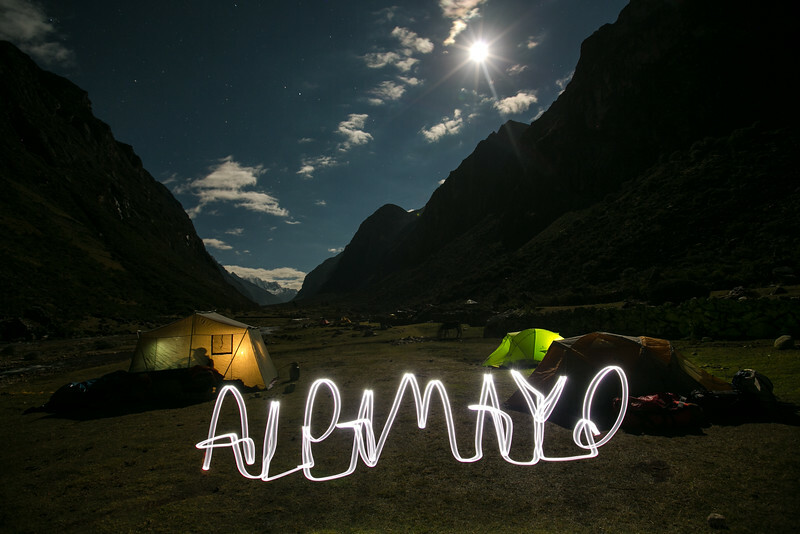 Peru offers all levels of climbing objectives, which allows us to deliver an appropriate and compelling adventure for you. This mountain, seen in the banner above, is one of Peru's true gems. Not for the faint of heart, this climb is a great test piece for those interested in technical high altitude climbing. The trek into basecamp is one of the most scenic in the country, and donkey support keep your pack under 10 pounds (4kg). From basecamp the trekking ends and the climbing begins. With climbing packs we advance up to the moraine camp, and finally high camp. On our summit push we will ascend 1000' (300m) of 50-75° snow and ice via the French Direct Route. Team members must be in top physical condition, aka "hard to kill" as Mark Twight puts it. Ice climbing skills are mandatory, and can be honed with prep days in the States prior to the expedition. 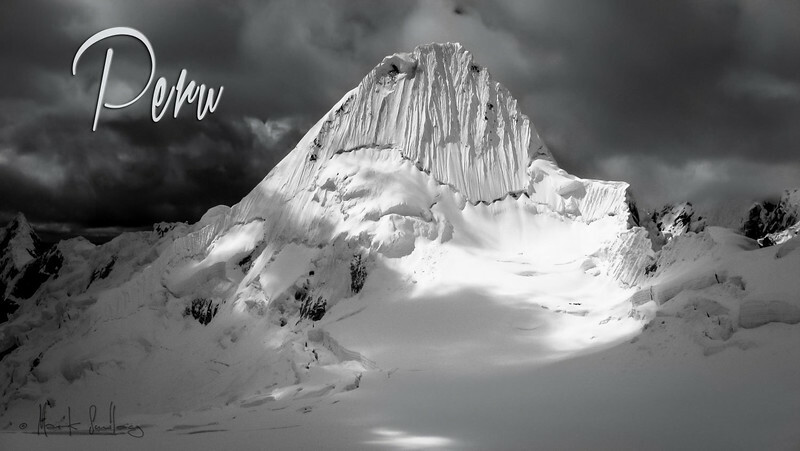 Mark Smiley is an IFMGA Licensed Mountain Guide, and will be leading the trip. °Max two team members for the summit, 1 guide (2:1 ratio). °Price: $5500 Includes: Hotels (double occupancy with rooms), Airfare Lima - Huaraz - Lima, ground transportation in country, food on mountain, guides, cooks, porters, donkeys, park fees, group gear, logistical support, training plan, 15% off all ice climbing prep days with Mark Smiley, pro level photos Mark takes of you in action during the expedition, and a beautiful ready-to-hang print of your favorite photograph from the trip. *$4900 for significant others that are interested in joining the trip, without climbing above basecamp. Rather, going on day hikes around the beautiful valley during the three day summit push. °Does not include: Airfare to Lima, food while off the mountain (restaurants), expenses incurred for itinerary deviation, personal travel insurance, airport taxes, personal expenses, alcohol, gratuities for Peruvian support staff (approx $5-$100/person depending on quality of service rendered. Mark will not accept tips. If you liked the service he rendered, show it by booking him for another trip). °Deposit: $1000 due to hold your reservation, non refundable. °You must be physically and mentally prepared to succeed on a climb of this difficulty. Mark will lay out a path to get you there. (1) June 1: Fly to Lima (airport code: LIM). Most flights arrive after 9PM. Sleep in 4-star hotel connected to the airport. (2) June 2: Flight to Huaraz in the early AM. Prep day in Huaraz. Sleep in Huaraz. (4) June 4: Hike to basecamp, 5-6 hrs. Donkey supported. (5) June 5: Hike to the Moraine camp, 3 hrs. Porter supported. (6) June 6: Climb to high camp, 6 hours. Self supported. (7) June 7: Summit day Alpamayo, 10 hours. Self supported. (8) June 8: Descend to basecamp, 6 hours. Self supported. (9) June 9: Hike out (10 miles), bus to Huaraz. Celebration Dinner! (10) June 10: Day bus back to Huaraz, 8 hours. Flights leave Lima after 10PM. (11) June 11: Arrive home in the morning. Shortly after, receive a wall display print of your favorite image from the trip.